Born in Florence at the beginning of the Italian Renaissance on March 6, 1475 when “Mercury and Venus were in the house of Jupiter,”  Michelangelo di Lodovico Buonarroti Simoni seemed destined to become a famous in the arts. And as fortune had it, he was able to study at the famed Garden of San Marco started by the famous patron of the arts, Lorenzo de’ Medici. Michelangelo’s skill as a sculptor soon became apparent with him creating “two extraordinary bas-reliefs, the Madonna of the Steps and the Battle of the Centaurs” by the age of fifteen or sixteen as noted by Thomas Cahill. However it wasn’t sculpting that would propel him into the realm of the uber famous, but rather it would be his skill with a paint brush that would set him apart. The canvas for his art, as the fates would have it, was a box-shaped chapel in Rome whose foundation was laid a mere two years before his birth. The journey from sculptor to painter was not an easy one for Michelangelo. Rather it was a journey full of political upheavals, family drama, personal rivalry, and four long years perched on a scaffold bend backward staring at a ceiling. 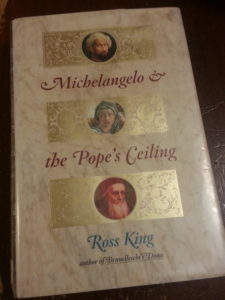 In his book Michelangelo & the Pope’s Ceiling, Ross King weaves these complex issues together into a single story showing how Pope Julius II pushed Michelangelo beyond his comfort zone and into the history books. Like most people I had heard about Michelangelo’s paintings on the vault of the Sistine Chapel and even seen replicates of famed Creation of Adam fresco. However my knowledge of these amazing paintings did not extent beyond simply recognizing their existence in the world. King’s book was a ray of sunlight into the darkness of my ignorance, bringing with it the understanding that the context surrounding the creation of a piece of art is just as important as the piece itself. This realization may sound simple as it is a common method of exegesis for literature, especially the Scriptures. Yet I must admit that before reading King’s book I had never considered studying the cultural and history context of a piece of art. Ross King. Michelangelo & the Pope’s Ceiling (New York: Walker & Company, 2003), 1. Ross King. Michelangelo & the Pope’s Ceiling, 2. Thomas Cahill. Heretics and Heroes: How Renaissance Artists and Reformation Priests Created Our World (New York: Nan A. Talese, 2013), 111. “Sistine Chapel,” Wikipedia, The Free Encyclopedia, accessed December 19, 2017, https://en.wikipedia.org/w/index.php?title=Sistine_Chapel&oldid=810499765. Ross King. Michelangelo & the Pope’s Ceiling, 34. Ross King. Michelangelo & the Pope’s Ceilingg, 217. Ross King. Michelangelo & the Pope’s Ceiling, 299. Ian Morgan Cron. Chasing Francis: A Pilgrim’s Tale (Grand Rapids, Michigan: Zondervan, 2013), 110. Ross King. Michelangelo & the Pope’s Ceiling, 313.